Whilst in Old Navy, I did buy a skirt and pair of trousers as well. However, J doesn’t really have a waist and no matter how tight I winch them, they always work their way down her body. By the end of the day they are halfway down her backside. The skirt is actually a skort, with jersey shorts attached, presumably to eliminate any risk of someone glimpsing her underwear. Americans are funny about modesty. While we were away, the weather was searingly hot and we kept visiting the water fountains in Central Park. Most of the play areas have some sort of watery bit. J will simply remove her clothes at the first sight of water and go dashing in, delightedly. 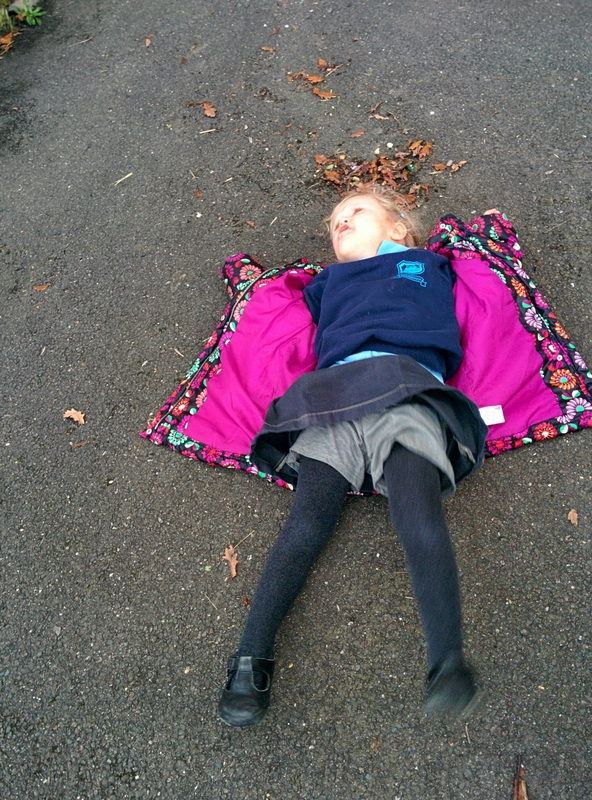 I figured this kept her clothes dry and I wasn’t organised enough to bring along swimwear. However, the little nudist got into trouble at the park near Union Square when an officious lady demanded to know if I was American. No, I said, revealing myself as one of those libertine Europeans. She scolded me and said the police could arrest me. I was about to suggest that I took my clothes off too, when she realised that a small interested crowd was developing and things were not going to go her way. She bustled off, but I did wrestle a pair of knickers onto Miss Bare Buttocks later on to avoid that happening again. 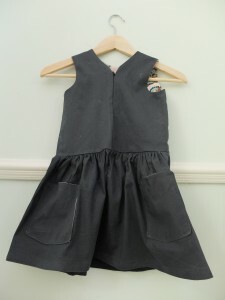 Anyway, I figured that until she got a bit taller and developed a waist, she could do with another pinafore. She has packed lunches and is not the world’s tidiest eater, so sometimes needs a fresh outfit daily. 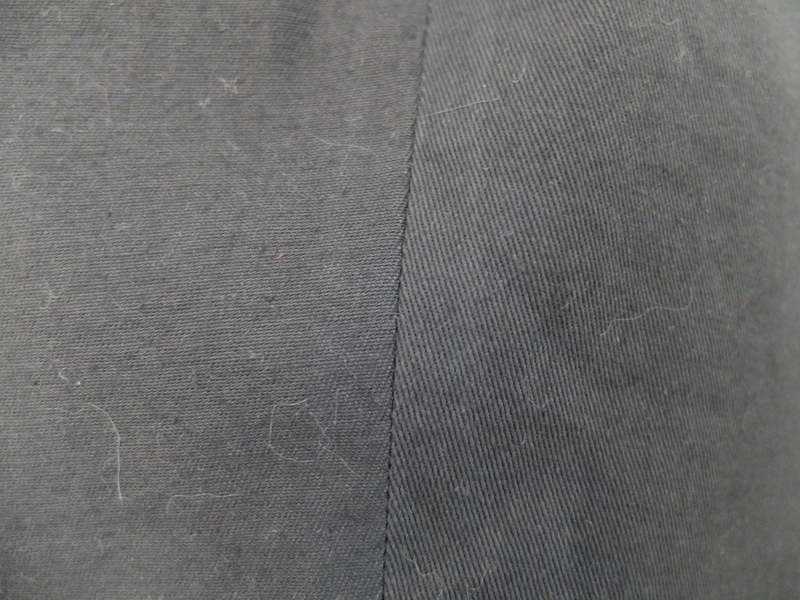 This time, I used organic cotton twill with a touch of Lycra from the Organic Cotton people again. They really are very good, and the delivery is fast and reliable. 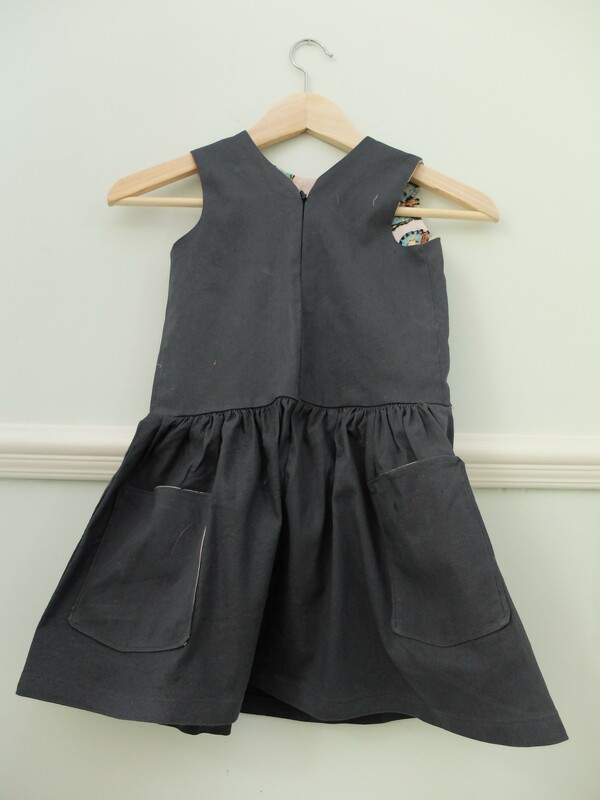 An obvious advantage of children’s clothes is that you can easily get at least one outfit from one metre of fabric, which makes an organic cotton twill pinafore relatively affordable – about £8. One of the skirt panels is the wrong way round. I can’t blame anyone but myself. I would have re-done it, but figured the only person who was likely to notice is me. Whoops. I forgot that twill has two sides. If she moves around enough and I don’t tell anyone, nobody will notice. 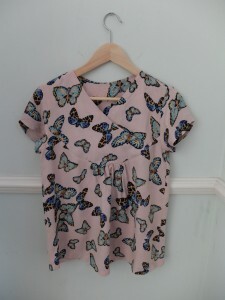 This time, the lining is butterfly print viscose. I bought the end of a roll from a small fabric shop in Acton the other week, for £2.50. 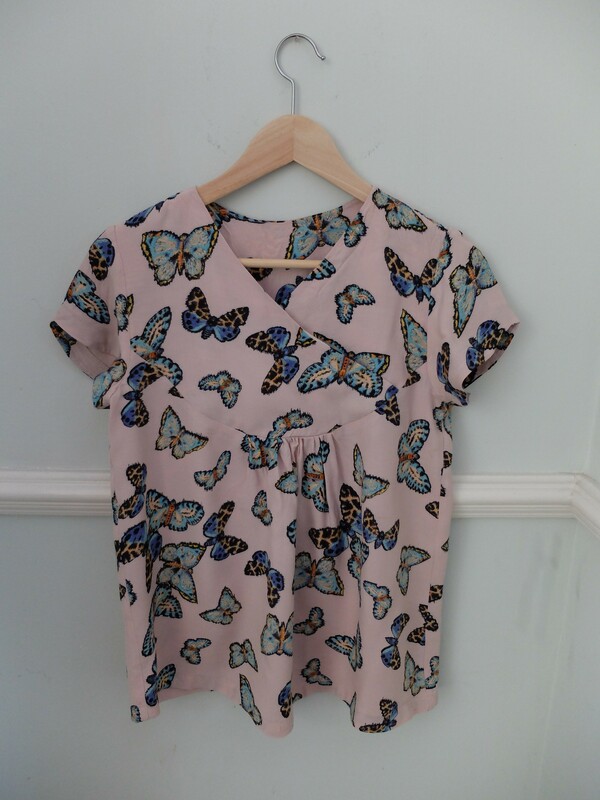 I had already made myself a Zsalya top from it, and used the rest here. 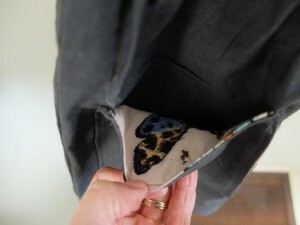 I added patch pockets, lined with the same stuff. Did I pleat the skirt? Er, no. I gathered it again. The twill is thick, but fairly drapey and flexible. I didn’t integrate the lining with the zip properly, because it might catch and stick, and J gets very wound up when her zips get stuck. That’s my excuse. The only real change from the first time around, pattern wise, was rounding out the back a bit more as the first version keeps puckering a bit here. 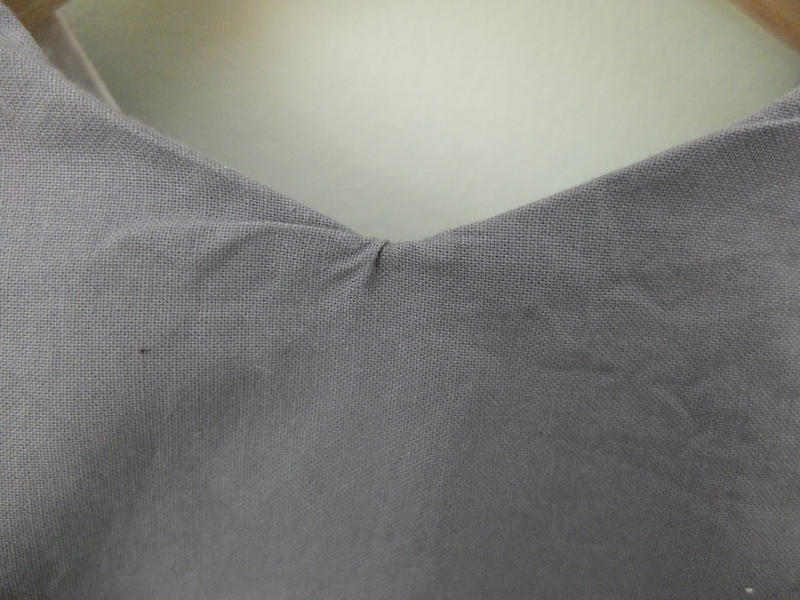 Puckering at the back of Version 1 – any attempt to steam this out makes it worse. Butterflies in her pockets. To go with the crumbs, rocks and rotten leaves. It’s survived so far. Apparently J’s teacher said “wow!” when she saw the insides. That’s good enough for me. 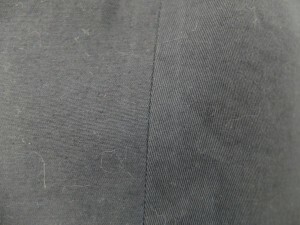 The twill is quite sticky and accumulates cat hair and other fluff, but it is soft, stretchy, warm and comfortable. 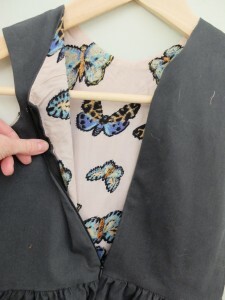 I thought maybe I should fashion a little heart or butterfly from Sugru for the zipper. I am still thinking about that..